Since I still had my Hydrangea set and card stock out, I used them for today's sketch on SCS. I changed swapped out the Burgundy for Riding Hood Red in my flower, added a bit of Close to Cocoa to the leaves, and tried my hand at stamping the beautiful vase that come with with set. I need a bit more practice at getting the vase to fit right with the flower bloom, I'll have to try a few more times before I clean up my studio. I added the Black Sheer Ribbon through the Filigree brad, then heated with my heat gun. For the Mellow Moss piece, I adhered my Black strip, then ran it through my Big Shot using the Cuttlebug Distressed Stripes Folder. I've had a few people ask about the images - you stamp them in stages to create your finished image. For example to create the flower - there are 4 different stamps, and I used 4 different inks. If you didn't have 4 coordinating inks, you could always ink your image, stamp off then stamp. I did this for the vase - as I didn't have 4 shades of Gray. 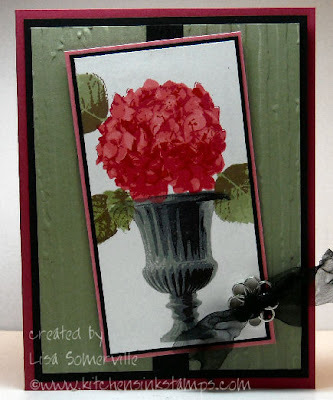 Love the Hydrangea flower cards Lisa. My favorite flower! Though with this kind of vase if you included some hints of stems it might help it look a bit more natural. My Mom loves these flowers and her's always have a bit of stem visible when they are displayed in this type of vase (actually in almost any kind of vase). WooooooooooooW! Wow! Wow! this is GORGEOUS!